Rod and Sabra – Rod Diridon, Jr.
Born in Denmark, Sabra Foley lived in Europe and the Middle East until the age of five, when she moved to Novato, California. She attended local public schools and graduated with honors from the University of California at Berkeley with a degree in Mass Communications. Sabra recently earned a Masters Degree in Public Administration from San Jose State University. During her time at Berkeley, Sabra helped found CalShine, a community based initiative to help connect families with their healthcare options. An avid photographer, Sabra was a member of the newspaper staff for UC Berkely’s Daily Californian, and prior to that, the Oak Leaf at Santa Rosa Community College. Sabra is the Director of Development for the Dr. Martin Luther King, Jr. Library at San Jose State University. She has also served as the Deputy Finance Director for Northern California for the Hillary Clinton for President Campaign and as the Director of Fundraising for the Santa Clara County Democratic party. For the four years before that, she had worked for State Senator Joe Simitian in a number of roles, including Campaign Manager for his 2002 re-election effort, Finance Director for his 2004 Senate campaign and a member of his legislative staff as a Senior Field Representative. Sabra is a member of numerous local political clubs as well, serving as a Board Member for the Democratic Activists for Women Now. She enjoys fighting for Democratic ideals in her professional and personal endeavors. In 2009, Rod and Sabra were married. 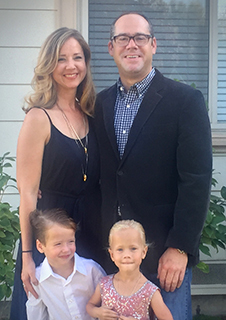 Rod has often said about Sabra, “I thank God every day for sending me a beautiful, smart and charming woman with bad eyesight and poor judgment in men!” Rod and Sabra live in Santa Clara and have two kids, Avery and Rodney. For more about Avery and Rodney’s entry into the world, see Early Stork Delivery No Problem for Kaiser NICU.